One day you will be hurt by someone, like you hurt me. One day someone will cheat on you, like you did on me. One day someone will look you in the eyes and lie to you, like you did to me. One day your partner will have an untold secret on their phone, like you did with me. One day you will cry yourself to sleep with hurt and despair, like i did with you. One day someone will love and care for me as much as i did for you. If you decide your relationship is no longer then end it, don’t cheat behind your partners back. 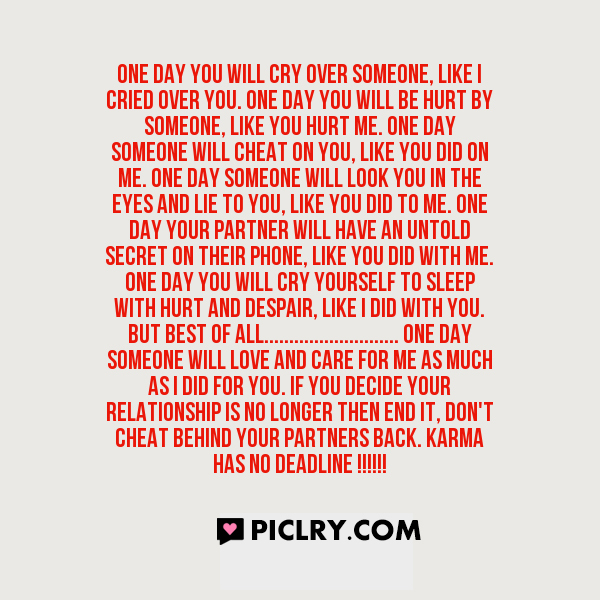 Karma has no deadline !!!!! !